Eurozone finance ministers will today discuss the key question of whether the Euro’s bailout fund will chip in to Ireland’s costs. THE EUROZONE’S finance ministers will today discuss the issue of whether the Eurozone’s new bailout fund will be used to help Ireland recover the costs it has already run up by bailing out AIB and Bank of Ireland. The meeting in Bruseels – which precedes a full meeting of the 27 EU finance ministers tomorrow – will debate the prospect of allowing the European Stability Mechanism fund to take a ‘retroactive’ role in banking bailouts. Speaking to reporters before the summit, Michael Noonan said ministers would hold a “dialogue” on the issue, with the views aired by ministers then included in draft guidelines being prepared by the EU. Noonan said the fact that IBRC was now taken out of the equation could make it easier to secure a deal which would see Ireland sell some of its stakes in Bank of Ireland and AIB to the bailout fund, recouping the cash it put in. “There are two words that are being used in the debate, up ’til now,” he said, “‘Legacy’ and ‘retrospective’ or ‘retroactive’. Legacies come when somebody dies… we have sorted out our legacy issues with our bad bank. Retroactive is the concept of applying whatever is agreed to trading banks like AIB and Bank of Ireland to compensate Ireland for the recapitalisations they made when the policy instruments that are now being put in place weren’t available. 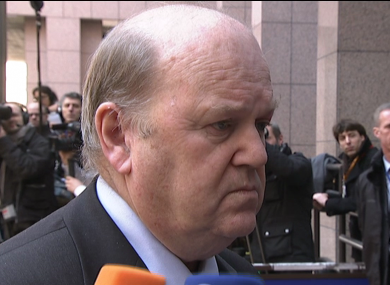 Noonan said there was a “valid case” for such a deal being reached, and that he would be “pushing the case strongly”. The two days of meetings – with tomorrow’s meeting of 27 ministers being chaired by Noonan, under Ireland’s EU presidency – will also discuss whether the bailout loans of Ireland and Portugal could be extended. Extending the repayment period would mean Ireland would have to devote less of its annual income to repaying its existing debts – though it would also mean it would take longer to pay off the loans. A similar arrangement was struck in July 2011 to lower the interest rate on Ireland’s bailout loans and extend the repayment period. The European parts of Ireland’s bailout loans have an average maturity date of 12 years, with the first full repayments due in December 2015 and the last in 2042. Noonan said Ireland was hoping to extend the term on its loans by about 15 years each, though he admitted he didn’t anticipate “a disposition” to extend the loans by that much. The Irish minister will hold a series of bilateral meetings with his colleagues on the fringes of the summit to try and encourage further support for the extension of Ireland’s repayment period. Email “Key meeting in Brussels to discuss whether AIB, BoI costs can be recouped”. Feedback on “Key meeting in Brussels to discuss whether AIB, BoI costs can be recouped”.